1.What is the guarantee on purchases? We GUARANTEE that we are committed to providing our customers with the highest possible quality product at the BEST RESONABLE PRICE. We GUARANTEE that your paintings will be exceptional! 2.What if I am looking for a particular painting that I do not see listed? We have a FREE search service to help locate art and accessories for you. You could also email to our customer service to request the image that you are looking for, we will be glad to help. 3.Can you reproduce paintings from my picture? Yes, we can reproduce any clear picture or photograph into an oil painting. The prices for custom reproductions and replicas will be priced according to the size and detail of the subject. You can contact us with the name of the artist and image, Email or regular mail us the image that you would like replicated. 4.Can paintings be reproduced in sizes other than the size that is listed? Yes, we paint to the order and could do any design for you. If you could not find the size you want on our website, please let us know the image and the size you need, and we would be happy to quote you a price. It's easy to order at FONTAINE . As you browse our product pages, click the "Add to Cart." link. When you’ve done shopping, review the items in your shopping cart, make any necessary changes, and complete the ordering process. We accept on-line payment via western union and bank transfer. To fax or mail your order, print out this order form and send it to us. 6.How can I pay? Is it safe to use my Credit Card? All prices on our site are listed in U.S. dollars. We accept payment by Paypal, Moneybook and bank transfer. All orders are confirmed within 24 hours of receipt. YES, it is definitely safe to use your credit card! 7.How long will it take until I receive my paintings? All paintings are hand-painted by our skilled artists and normally delivery period is about 3-15 working days from the date we confirm your payment. Once the order is ready, our customer service will send you images taken from finished paintings to confirm. When we have your confirmation, we will arrange to ship them by courier which only takes 2-5 working days. 8.How do I check the Status of my Order? Paintings will be ready approximately 12-15 working days from the date we receive your payment. Please check your order confirmation email to see the approximate scheduled completion date, or simply go back to our site and track your order status by entering your order number which has been advised in your order confirmation e-mail, our customer service will keep you informed and let you know the progress as the delivery period gets closer. 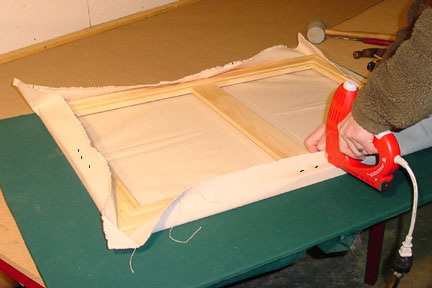 9.Do you have minimum order quantity for Gallery wrap paintings? How do you ship them? There is no minimum order quantity, and we will ship them by TNT/UPS to you if the volume iis less than 1 CBM, for over 1 CMB (Height (m) x Width(m) x high (m) ), we would suggest to have them shipped by sea which may take 20-30 sailing days. 10.If I order a painting from you, could you stretch it for me? Yes, we could stretch for you and make it Gallery wrap which you could hang it on the wall directly. But as the shipping cost is quite high to have it shipped from China to you, we suggest you have painting stretched in your local shop if the size of the painting you order is bigger than 24x36inch or you order more than 1 painting in a big size at a time. 11.I've never bought art/anything on the Internet before, how do I know I can trust you? We supply oil paintings and ship them all over the world for many years. Every sale is handled individually and is backed up by the very best in customer service. We accept paypal and will confirm every step of the way with you so you know exactly how much you are paying, when your art is shipped and when you can expect delivery. We have hundreds of happy customers and we want you to join their group to see what our other customers’ said about ordering from us. Yes, we can ship to any destination in the world absolutely. 2.Can I ship to a different location other than my billing address? Yes, No problem. Once you place an order from our shopping cart, you could fill in your billing address and shipping address. Then we will ship to your shipping address when paintings are finished. You could also send us email to inform us you need to change the address. We will keep your record in our system. Complete shipping information is available online when you complete an order by our shopping cart, the shipping cost will be automatically calculated based on which country your order will be shipped and order quantity ordered. If you want to get a brief idea of shipping cost for the order that you may place, please check with our on-line transportation here ( on our homepage). Orders are normally shipped by UPS to USA, Mexico and via TNT to European countries. It is the fastest way to ship paintings, only need about 2-3 working days. For bulk order, over 1 CBM, we would suggest to have the order shipped by Sea, which normally takes 20-30 sailing days. If the paintings you order request no framing or stretching, the paintings will be shipped rolled in tubes. 5.What if I want to order multiple paintings with different shipping addresses? No problem, please advise shipping address for each of the paintings you order and we have your orders updated to our system with different order number. When paintings are ready, we will ship them to the different address you mentioned. Of cause, we will send you images to confirm and double check with you the delivery address. 1.Can I have a price list for all your products. It is all here, listed on our site, every painting has been priced in top, high and medium quality. If you have questions, please contact our customer service for a quote, with the image, size you are interested in and we will quote you in 24 hours. 2. Do you offer volume discount? Yes, we offer volume discount for bulk order, please contact our sales reps for more info, and would be better if you would send a fix order or your last order to us to price it . 1.What does your ‘museum” “high” and “medium” quality mean? If I order a museum quality painting from your site, what can I expect from you? If you order a museum quality painting, we will have your order painted by one artist of our Fontaine gallery, to whom we think is capable to resemble the artwork for you. But as every artist has own style and own finishing touch, therefore we can't guarantee the paintings are exactly the same as original because paintings are hand painted. However, we will arrange different levels of the experienced artists to paint for your order, according to the quality and price. If you wish to order in commercial(medium) quality, please let us know, and we will quote you in return, please note there is a minimums order quantity for commercial quality which is 100 paintings to start. All the paintings are 100% hand paint on canvas. 2.How can I tell what the painting will really look like? We have an artists’ team to work for your paintings. They are good at different style of paintings. And we have a very firmed Quality Control Department to control the quality of paintings. For every painting for every order, we will take photo and then update it to your order; you could approve the images or advice if you want our artists to make any improvement for you. Sorry, we don’t sell frame in small quantity, the minimums order quantity for frame is 500 frames, and we could supply our Frame CD catalogue per requested for potential customers. 4.Do you sell stock paintings? How could I order them? Yes, we sell stock paintings in very competitive price. We have updated them to our website and we will keep updating our lastest stock 1-2 month(s). Please find your favorite from our web.Once we receive the payment, we will deliver the paintings to you in 24 hours. 5. 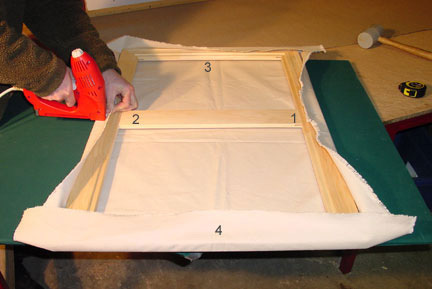 For your Gallery wrap paintings, if you only offer the three sizes you mark on the website? These Gallery wrap paintings are designed by our artists and all images are in square, the sizes 50x50cm, 60x60cm, and 80x80cm are the best size we suggested. Of cause if you want to order them in other size, we could paint to the order. 6.I really want a portrait of my wife/horse/house/motorcycle - can you help? Most likely, yes. The first thing you should do is send us email with the photo and advice the size you want, we will quote you back soon! 7.Do you have a catalog that you can mail to me? We do not have a catalog that we can mail since our inventory is changing daily. We request that you use our website for the images that we offer. 8. Can you tell me what painting style is fashionable at the moment? Contemporary art is our best-seller collection at the moment now. 1.What if I am not happy with my purchase? You email us within 3 days of receipt of paintings. Pack your paintings in the original packaging they were shipped in and mark “SAMPLE, NO VALUE” on the package and then return the package within 7 days to our company. Please include all the necessary information to process your return such as your packing slip, the return authorization number and a note stating the reason for the return. If you do not have the packing slip, please include a note with your order number, your email address, the first and last name the order was placed under, and the reason for return. Please note that paintings that have been approved through preview visuals are not refundable. Once approved, the artists will be paid and refunds cannot be issued for these paintings. 2.What if my purchase arrives damaged? All damaged shipments require prior authorization from our company before the package is returned and please contact us within 3 days of receipt of paintings, and with images of the damaged shipment, if possible. fontainartgallery.com will make arrangements to have the damaged artwork inspected, replaced. All original packaging, documentation and shipping materials must be saved. Unauthorized returns will be refused. Yes, We wholesale directly to interior designers, architects, corporate art buyers,galleries, furniture stores, etc. Wholesale prices can be quoted for quantity purchases after proper credentials are provided to us. When requesting quantity wholesale prices, please include the name, location and type of business. 2.I am interested in selling oil paintings, can you do drop-shipping? Yes, we do drop-shipping, see our dropshipping facility here, All orders will be confirmed to you firstly by mail with estimated despatch date. We will package and add your labeling (you to supply) and immediately send you the TNT/UPS tracking number on dispatch We will dispatch directly from here. (Xiamen, China) There are currently no limits on the volume we can handle. Delivery is 15/17 days from confirmed order date Our operation is tailored to the specific needs of drop ship fulfillment from a dedicated team of customer service representatives to trained specialists in our fulfillment operation. Long-term and short-term warehousing of customer-owned products. Information customized for your customer. 1.Can you appraise a painting that I own? We're sorry, at this time we are not offering this service. 3. How do I change my Customer Account Profile information? Once you are logged in, you can select "My Account" and your present profile will be displayed for you to make any changes. 4.What if I forgot my Password? Not a problem at all! Send a email to us and we would be happy to send your Password via email to your registered email address. 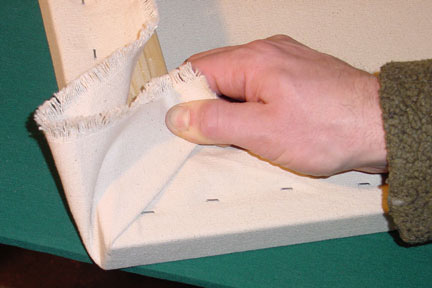 5.How to stretch a canvas? i. On a flat surface, lay stretcher on the canvas. 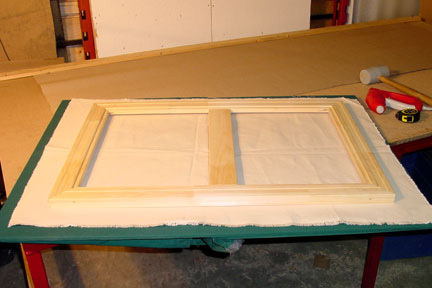 Be sure to leave just enough canvas to stretch onto frame (around 4 inches on all sides). ii. 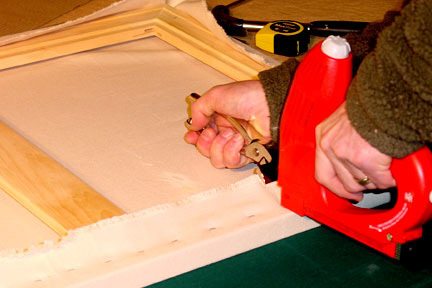 Start by stapling the canvas in the centre of each bar (steps 1, 2, 3, 4). 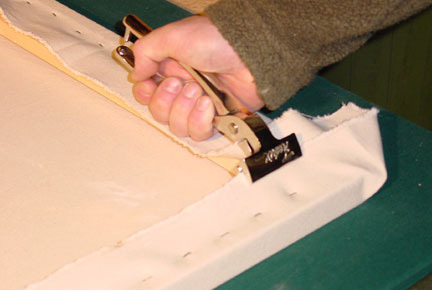 Pull canvas tight using canvas pliers, or by hand and staple in place. iii.Working again on all four sides as above (steps 1, 2, 3, 4), drive 3 more staples about 1.5 inches apart on each side of the first staple, applying tension to the canvas while stapling. iv. Continue in this fashion, working from the centre out, driving 3 staples at a time. 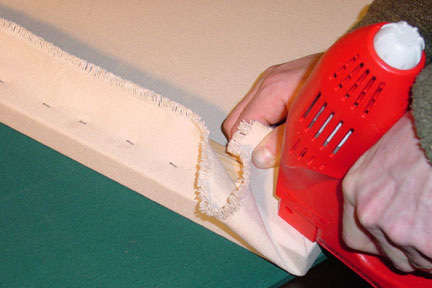 v. Leave about 4 inches from the end unstapled on one side to allow for the corner fold. vi. 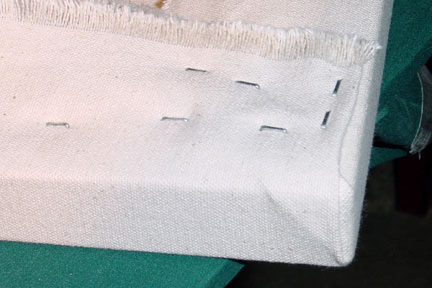 Staple the other side right to the end and pull the corner of the canvas in……..
viii. 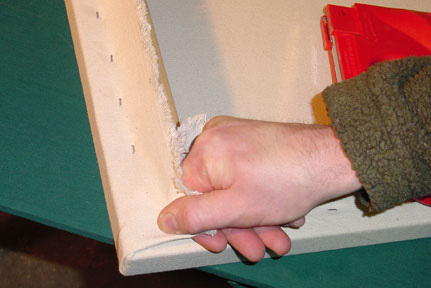 Pull the remaining canvas tight and staple. ix. This is what a finished corner looks like. Repeat on the remaining corners.